vSphere 5.5 Update 2 has just released and among the various bug fixes, one that stands out the most to me and I am sure everyone will be quite happy about (including myself) is the ability to now edit a Virtual Hardware 10 Virtual Machine using the legacy vSphere C# Client. 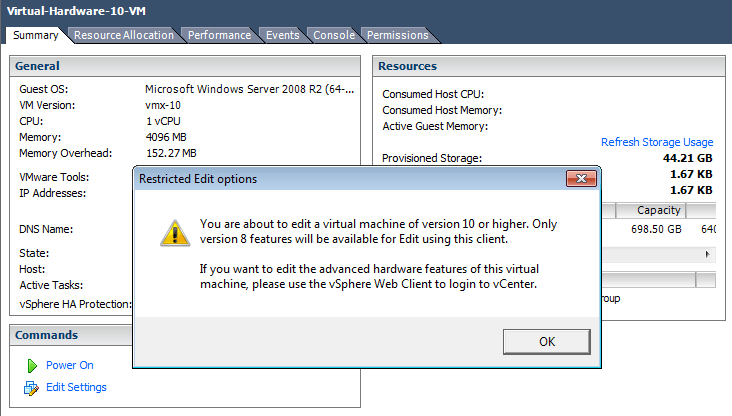 Previously, if you tried to edit a Virtual Machine running the latest Virtual Hardware (version 10), you would get a warning message prompting you to use the vSphere Web Client and the operation would be blocked. The feedback has been loud and clear from customers/partners and I am glad to see that VMware has re-instated this functionality in the latest vSphere 5.5 Update 2 C# Client. You will still be prompted with a dialog noting that only Virtual Hardware Version 8 features will be editable using the vSphere C# Client and that all newer Virtual Hardware features, you should still leverage the vSphere Web Client and/or vSphere API. This will at least allow you to edit basic functionality of a VM when vCenter Server is unavailable or if you are not running vCenter Server but wish to use the new Virtual Hardware version. Note: You do not need to install vSphere 5.5 Update 2 to be able to use this new functionality, you just need to upgrade your vSphere C# Client to the vSphere 5.5 Update 2 release and you will be able to connect to previous versions of vSphere 5.5 (vCenter Server & ESXi). How can I disable this message? I’ve asked engineering and it is not possible to disable the message. Leverage? Seriously, can you use the word “use” or pick another word, as it starts to get really comical by the time you use “leverage” for the third time. A step in the right direction 🙂 pls don’t be like MS and force us to things that aren’t usuable. Is there some way to disable this prompt and act like others? Can you ask VMware engineering about including support in the C# client for editing with all VM Version 10 hardware features AND all new vCenter features? I really REALLY hate the flash-based web client, which seems like a huge step backwards, despite the extra functionality. The simple buffoonery of VMware engineering is the extreme opposite balance to the innovative brilliance VMware engineering at times exhibits, to leverage this thought in other terms… VMware engineering is stupid beyond reason at times, just as they are quite clever at times, leaving their competition abused and confused. Unfortunately, apparently in either case, being stupid or clever, believe their customers are always simplistic and idiotic… VMware stop the nanny protectionist messages, it is insulting, and insulting your customer base, reduces customer loyalty, and in due course, profitability. The product interoperability matrix shows the client 5.5 U2 is only compatible with vCenter 5.5U2, not any previous version of vCenter, are you able to confirm if it’s just an oversight in the matrix? 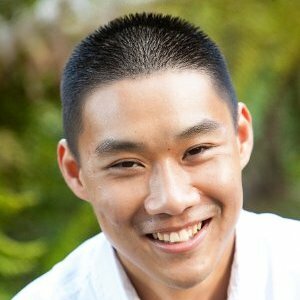 How can I get Virtual Machine stats using vSphere API?